Monza is a modern low shape, with chunky wooden feet, pocket sprung seats, and excellent padding for lumbar support. 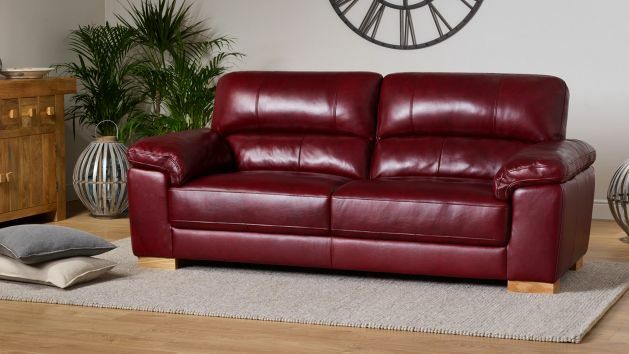 There's no wonder why Monza is one of our most popular leather ranges; it combines a simple modern shape with great comfort and high quality construction for a selection of sofas that suit any space. Monza comes in a wide selection of colours of real leather upholstery and great sizes too, so you can create a look you love in your living room. The range features softly padded arms, a generous seating area, and chunky solid oak feet. The modern, low shape invited you to sit back and relax in comfort, and the back is filled for excellent lumbar support. Monza's seats are pocket sprung for comfort and shape retention, and hardwood is integral to the frame, which uses screwed, glued, and pinned joints for superior strength and durability. Browse all the great pieces and colours in the Monza range today!